I must say, websites are my favorite. It's one thing to design something on paper, and it's another when it comes alive on the screen. Storytelling and drama combined with user-friendly functionality. I get to work with some mighty creative minds, let me tell you. This girl decided to go off on her own and be a solo interior designer. Almost a year later, she has had non-stop business, due in part to her unique but classic signature style. She can do it all! Click here to view the website for Hannah Sutter Interiors. Leadership coaching, mentoring, workshops, and support provided by a John Maxwell certified Leadership Coach. Seriously inspiring, seriously needed. The Gannon Team even offers free leadership community classes once a month. Click here to view the website for Locus Leadership. This girl is creative with a capital "C." The jewelry designs she just "throws together" are unique, high-quality, and one of a kind. Great for dressing up or dressing down. The designer came to me after having a successful Etsy store for several years, and wanting to take her business to the next level. This was such a fun project to work on, and I may or may not have shopped a little as well! Click here to view the website for Sand Plum Soul Designs. Talk about heartfelt. I think I learned as much from Dr. Ritter and his lovely wife Kris as they did from me. I got a mini church service every time I worked on this site! Dr. Ritter retired on June 30, 2005 after 40 years as a United Methodist minister and 12 years as senior minister of the 3200 member First United Methodist Church of Birmingham, Michigan. I am very proud to have helped in this project of sharing his life's work. Click here to view the website for Dr. William Ritter. I have talented friends. Ryan Robinson is married to one of my good friends, and his website was in need of a face lift. Robinson, as you may have guessed, plays the tuba and joined the faculty of the Oklahoma City University Wanda L. Bass School of Music in 2011. He is currently the Principal Tuba of the Symphony of Northwest Arkansas (SoNA) and Principal Tuba of the Lawton Philharmonic. Click here to view the website for Ryan Robinson. Bill Blair was referred to me by Amy Shrodes of "Lost and Found Cat." Blair is an author for children's books, and was unfortunately included in the Tate Publishing scandal of 2016. This website was his first step in self-publishing and recovering his losses. Click here to view the website for Bill Blair and his book, "Arnie Armadillo & His New Adventure." A friend approached me about creating a website for a book deal she had with Random House Publishing. The site needed to be accessed internationally, with easy-to-execute additions as the book tour progressed. See the full story about Amy Shrodes and her book, Lost and Found Cat on the blog! Click here to view the website for the book, "Lost and Found Cat." This nonprofit is one of the sweetest, most touching organizations I have ever worked with. They had been using an outdated platform to manage their website, and it was hard for the small staff to make updates. Building a new website included not only a fresh look, but also functionality that made it easy for the Breaking Chains staff to manage with limited web experience. Click here to view the website for Breaking Chains Honduras. 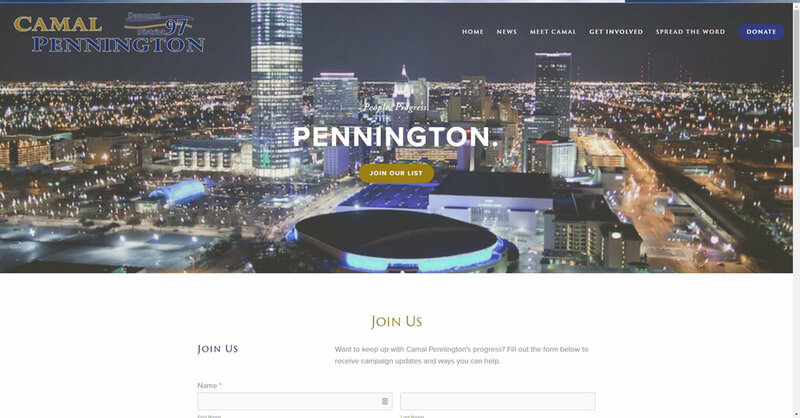 In 2016 I built a fundraising website for a friend who was running for State office in Oklahoma. 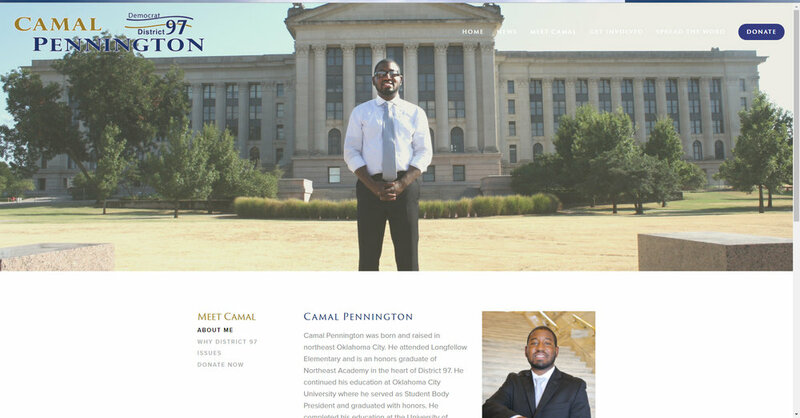 By the end of his campaign, he had raised more money than either of his opponents, and was complimented highly on his web functionality and design. While the campaign is over and his website is no longer needed, here are some screenshots to view. In 2014, I was assigned to a small working group responsible for the relaunch of the National Cowboy & Western Heritage Museum's website. The old website had been launched in mid-2000, and had not been updated since. It was also not on a CMS platform, so any edits had to be hard-codded. There was not any analytics attached to the website for measurement. Needless to say, it was dysfunctional and a poor representation of our national institution. The new website launched in early 2015, and has had a positive response. As time goes on, edits and adjustments are made in a trial-and-error fashion. 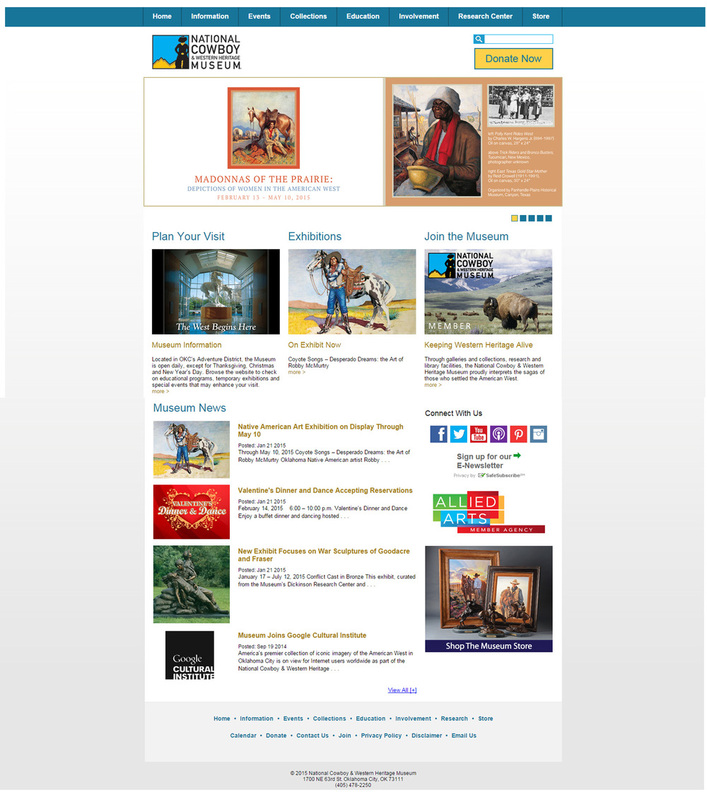 Click here to view the National Cowboy Museum's website. 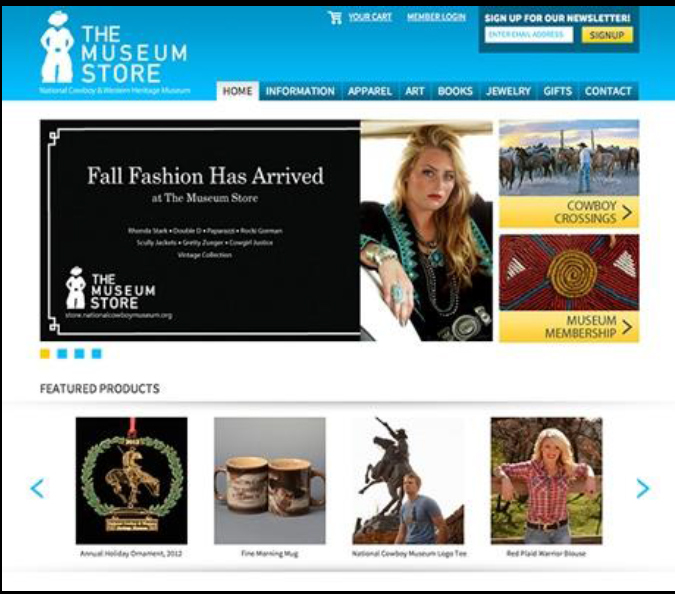 The Museum Store at the National Cowboy & Western Heritage Museum needed a website facelift, including some edits for improved functionality. The project began in May and was completed in September 2013. Response to the new website was very positive, with sales increasing steadily during the last quarter of 2013, and surpassing goals in the first quarter 2014. Click here to see The Museum Store website.